KENNEWICK, WA – Usually, the best way to disrupt a pattern is to have an external force change a part of it. Well, Mother Nature tried, but it was not enough to get the Americans out of their funk. Kent Simpson stopped 31 shots and Parker Stanfield scored the winner on a penalty shot, as the Everett Silvertips (26-25-5-4, 61 pts) walked away with a 3-2 win over the Tri-City Americans (36-18-2-2, 76 pts) in front of 3,654 fans at the Toyota Center. 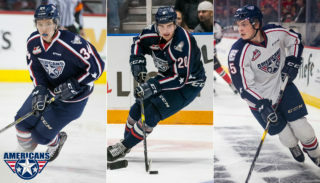 With the win, Everett, who owns a 5-2-0-1 record vs. Tri-City in the 10-game season series, has now won three straight and has handed the Americans two of their seven home losses this season. Meanwhile, Tri-City dropped their third consecutive home game, something they had not done as a club since Dec. 31, 2006 thru Jan. 5 2007. Weather and road conditions forced a one-hour delay on Tuesday, but the Silvertips did their best to make up for lost time. Just 5:31 into the contest, Tyler Maxwell caught the Americans in a line change and broke out Ryan Murray. Murray then fed a well-timed pass, across the crease, to a hustling Manraj Hayer, who connected into the near empty net. Tri-City, though, countered six and a half minutes later. After Kruise Reddick’s shot ignited a scramble in front of Simpson, David Conrad was able to pop the puck over the Everett netminder, who crashed into the goal to try and make the save. 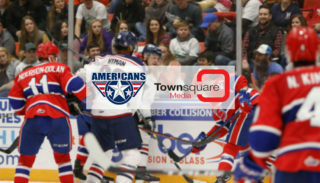 Following the review, Conrad’s goal was upheld and the Americans had knotted the game at 1. However, with just under seven minutes gone in the second period, a nice play behind the Tri-City net allowed Clayton Cumiskey to find Josh Winquist in the slot, who recorded his seventh goal of the season. Despite being outshot 25 to 14 after 40 minutes, Everett took their 2-1 lead into the third period, where they would hold off a late flurry from the Americans. But first, with 4:12 left in regulation, and after he was interfered with on a breakaway, Stanfield was awarded his penalty shot. From inside the slot, Stanfield’s attempt glanced off the left shoulder of Tri-City starter, Cam Gorchynski, and across the line, making it a 3-1 game. With less than three minutes remaining, and after they had sustained pressure in the Everett zone, Tri-City coach Jim Hiller pulled Gorchynski for the extra attacker. The gamble paid off, as Zachary Yuen was able to cheat up and bang in an Adam Hughesman rebound, pulling the Americans back to within one. In a last ditch effort to tie the game, Hiller took a second chance, but the club could not find the equalizer. Simpson, behind his 31 saves, earned his 20th win of the season and 50th of his WHL career. Meanwhile, Gorchynski, who had not made a WHL start since Feb. 25, 2009 as a member of the Red Deer Rebels, made 20 saves in the loss. Tri-City went 0-for-2 on the power play but was a perfect 4-of-4 on the penalty kill. After completing a brutal eight games in 12 days stretch, the Americans will get two days off before yet another tripleheader weekend. 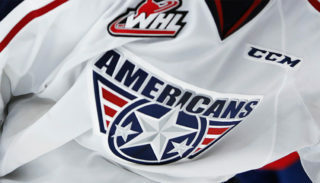 Tri-City will kick-off the weekend at home on Friday, February 25 when they host the Seattle Thunderbirds (21-29-4-5). Game time is 7:05 p.m. at the Toyota Center. Seattle, winners of two of their last three, is 0-5-0-2 vs. Tri-City this season and has lost 12 of their last 13 against their division counterparts. 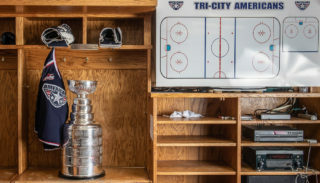 Tri-City, meanwhile, will be looking to put an end to their three-game home losing skid. Tickets are available through all Ticketmaster outlets, including online at ticketmaster.com, the Toyota Center box office, or all Fred Meyer outlets. The game will also be broadcast live on NewsTalk 870 AM, starting with the Sterling Savings Bank Warm-up Show at 6:45 p.m.